Collaborations, fusion, mixed media, old wine in new bottles. Such is the life blood and raison d’être of the international festival and when it goes right it is a unique opportunity for audiences to immerse themselves in something unrepeatable and rather special. 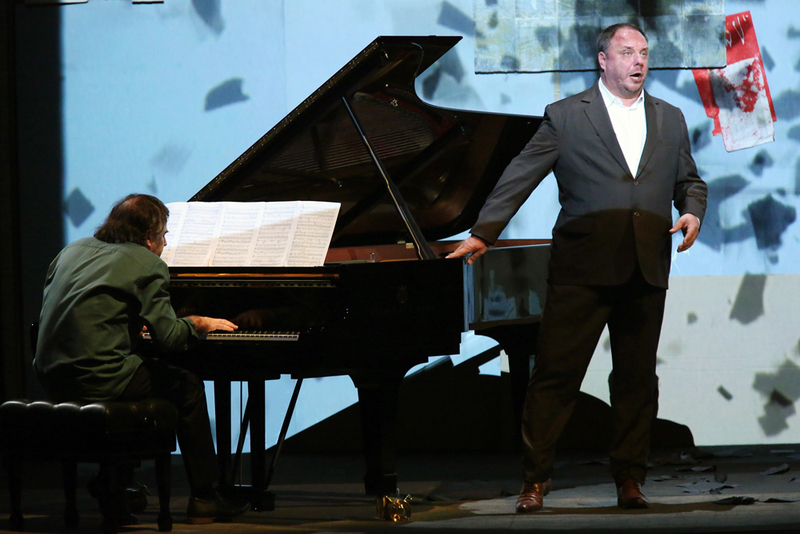 Such is the case with this bold take on Schubert’s bleakest song cycle, Winterreise, as performed by German bass-baritone Matthias Goerne and pianist Markus Hinterhaüser against a vivid and hypnotic filmic backdrop courtesy of South African artist and director William Kentridge. With three recordings of the cycle under his belt over 20 years, Goerne is among the most respected Schubertians in the business and his extraordinary performance is worth the price of admission alone. Possessed of an ideally dark instrument for this supremely introspective and mournful work, he is able to switch from a warm lyricism to a Wotan-like bluster with no apparent effort. His tone flows over you like warm molasses, descending into a rich sepulchral bottom register, yet able to scale back and float the top while retaining a vital steely core to the voice. Hinterhaüser is a most sensitive partner, adding considerable pianistic colour to song after song and valiantly supporting several of Goerne’s daringly drawn out interpretations in songs like the spectral Das Wirsthaus (The Inn) and the infinitude of the concluding Der Leiermann (The Hurdy-Gurdy Man). A former lieder partner of Brigitte Fassbaender but also a contemporary music specialist, he brings to the party a special fusion of the emotional with the precise. For the visual element, Kentridge has drawn on a wide range of pre-existing works created over the last 25 years, fusing them with a wealth of new ideas into something mostly cohesive and always intellectually and emotionally engaging. Working on several planes simultaneously, he hints at connections rather than illustrates, never narrating but creating resonances that sometimes go far beyond the relatively literal poetry of Wilhelm Müller’s 24 songs. His chiefly black and white line drawings are perfect for Winterreise, inhabiting the same twilight world as Doré’s moody illustrations for Dante’s Inferno. Kentridge parallels 19th-century Vienna and a wintery Friedrich landscape with 20th-century Johannesburg and the bleached Highveld. Occasionally he allows himself to be literal – a bird, a fish, a woman – but more often oblique – a mine shaft for a hill, a tap and sink for inclement weather. Sheets of paper are pasted up to make a kind of story board backdrop, pages turn to show the passage of time, leaves swirl to create the form of a woman – a distant beloved who may be living or might be dead, possibly even killed! Frequently, as in much of his work, we see the artist himself as watcher, walker or as simply a bereft figure of loneliness. In short, it’s a striking and beautiful work of art in its own right. If all this sounds like two shows going on at the same time, it is and it isn’t. 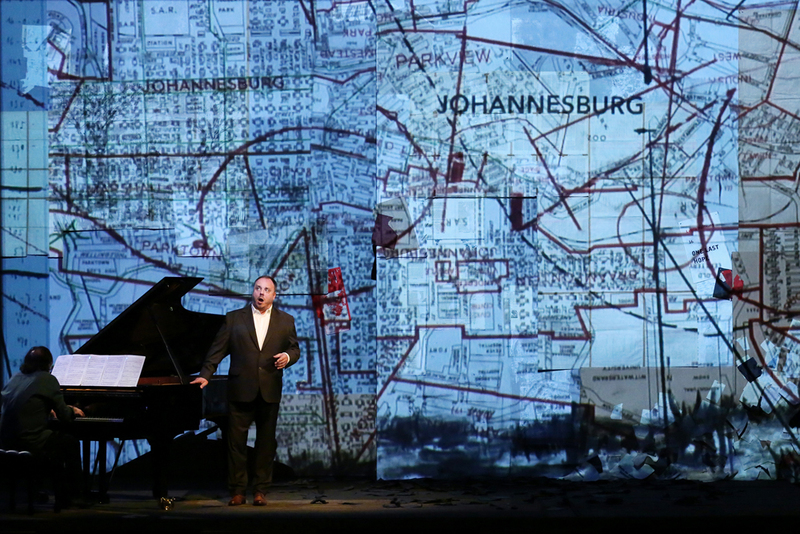 What Kentridge has created is a kind of visual mind-map, able to capture Winterreise’s crucial reflective nature while sitting beside and behind the singer like a window into his fracturing mentality. Goerne responds with a dramatic performance of enormous subtlety, gazing out at the audience with great haunted eyes, the projections playing across his features like fleeting dreams. Clutching the piano as if terrified at times of being sucked into the nightmare of his own subconscious, the weary plod of Gute Nacht suggests he has gone on this journey many times before. He acts with his whole body, and when he turns to stare and is met by the mirror image of a Kentridge eye staring back it’s almost unbearable. Every now and then there’s a moment of mismatch – the lines flashing by at the start of Der Lindenbaum seem too fleet of foot for Schubert’s gentle reminiscence, the MRI scan imagery seems a bit left-field – but generally it’s surprising how rarely the rapid flow of domestic memory into bleak landscape disturbs our concentration on the singer and his songs. Of those 24 miniature dramas, several remain in the mind well after the performance is done: Goerne’s intense exploration of Der Greise Kopf (The Grey Head); his borderline bewildered delivery of a line like “Krähe, wunderliches Tier” (Crow, you strange creature); Kentridge’s shadowy hanged men falling, melting into the ground, and the subsequent blooming of his sacrificial tree hinting at the cycle of life. Perhaps the most powerful imagery is saved for the final song. As Goerne describes the ominous figure of the old hurdy-gurdy man lurking at the edge of the village, Kentridge responds with an uncanny procession of his iconic shadow figures (which I remember from his remarkable installation at the Perth Festival a couple of years back). Half carnival, half funeral, you’d think it shouldn’t work, or it might pull in the opposite direction from the Schubert, but no. The sense of us all careering toward the grave actually enhances Goerne’s tentative reaching out for some kind of resolution. “Wunderlicher Alter, Soll ich mit dir gehn?” (Strange old man, shall I go with you? ), he gasps as the eerie figures recede into nothingness – and at that precise moment these two artists achieve a perfect fusion – so gripping, so desperate, so lost. See it. Winterreise is at City Recital Hall, Angel Place for one more performance tonight at 8pm.